For all the Truthers, Christians and Patriots out there this document is really important..please read the report from Lisa Haven below and also I have included a link for the actual document so you can read for your self. PLEASE SHARE! So how exactly do they plan on “Mastering the Human Domain? – Use of the enhanced capabilities to identify and classify the human domain; to determine whether they are adversarial, friendly, neutral, or unknown. 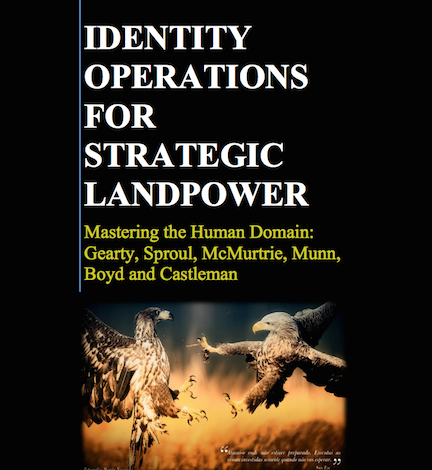 – Use of all-source intelligence analysts to provide back-end analysis and reporting to fuse the many sources of information (much received through operational reporting) regarding the human domain in order to identify individual(s) and their intent. Based upon risk, use of Identity data (and its fusion with other information and intelligence), will enhance force protection for bases, installations, detainee and checkpoint operations, as well as many other mission sets. – Use of the enhanced capabilities to identify and manage local populations during major combat, stability, and humanitarian assistance and/or disaster relief operations.